Metal-detecting between 1994 and 2013 has revealed the site of a possible Roman settlement in Forncett. Roman finds from the site include pottery and metal artefacts, over 100 coins (including a Mark Antony legionary coin), a finger ring, brooches and a bracelet reused as a finger ring. Non-Roman finds include part of a Middle Bronze Age rapier blade and a Late Bronze Age socketed axehead; an Iron Age Iceni coin; Early Saxon brooches; a medieval coin hoard of two coins, buckles, brooches, an ampulla, seal marix and a chafing dish handle; a medieval/post-medieval vessel fragment and post-medieval dress accessories, jettons, lead weights and part of a dagger. 1994. Metal detecting. Context 1. Rear hook brooch, 40 to 60/65 AD. Identified by D. Mackreth, June 1995. W. Milligan (NCM), 16 January 1995. Identified by J. Davies (NCM), 22 May 1995. Roman toilet article (nail cleaner). Two medieval/post medieval lead weights. 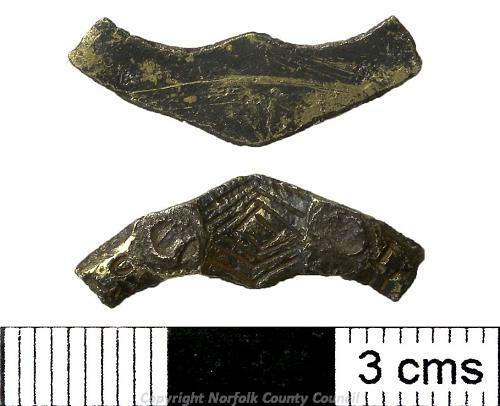 Early post medieval chafing dish handle. Polaroids (S1) and list in file. Identified by S. Margeson (NCM), June 1995. W. Milligan (NCM), 8 February 1995. Identified by J. Davies (NCM), 28 March 1995. W. Milligan (NCM) 13 March 1995. August 1996. Context 2. Metal detecting rally. Medieval and post medieval coins, oysters. D. Gurney (NLA), 27 August 1996. Twenty-seven Roman coins, lead weight, bracelet reused as finger ring, hairpin, crossbow brooch terminal, belt fitting. Post medieval jetton and handle. See coin forms and list in file. 1997 or earlier. Metal detecting. Centre loop cosmetic mortar, (S3). Four brooches and ?military belt/apron mount. See list and form in file. D. Gurney (NLA), 7 November 1997. December 1997 and 1998. Metal detecting. Roman and Early Saxon brooches. Medieval and post medieval finds. K. Sussams (NCM), 13 May 1999. December 1998 to January 1999. Metal detecting. By member of the public . 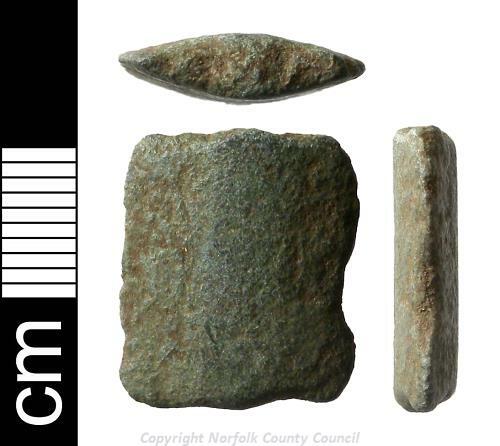 Early Saxon cruciform brooch knob, (S4). January to February 1999 and October to November 1999. Metal detecting. By member of the public . Five and four Roman coins. A. Rogerson (NLA), 1 March 2000. October to November 2000. Metal detecting. Fourteen Roman and one medieval coin. Roman and medieval metal objects. A. Rogerson (NLA), 22 December 2000. Roman sherds and metal finds. A. Rogerson (NLA), 21 February 2001. Six Roman and two post medieval coins. One post medieval jetton and one post medieval token. A. Rogerson (NLA), 16 November 2005. A. Rogerson (NLA), 19 October 2005. The Roman finds suggest that this may be the site of a Roman settlement. D. Robertson & A. Rogerson (NLA), 15 December 2005. One Roman coin, Romano-British and medieval/post-medieval metal objects. A. Rogerson (HES), 20 October 2010. Probable hoard of two medieval coins, one other medieval coin and one post-medieval coin, medieval/post-medieval and post-medieval metal objects. A. Rogerson (HES), 21 September 2011. Post-medieval coin and jetton, medieval, post-medieval and undatable metal objects. A. Rogerson (HES), 19 October 2011. Treasure report on the hoard of two medieval groats found August 2011 and reported as treasure case 2011 T617, added to file. 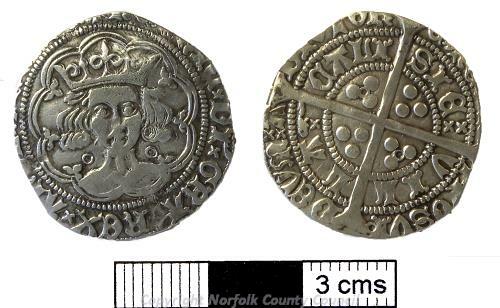 The hoard of groats found in August 2011 and reported as Treasure Case 2011 T617, were declared Treasure at inquest on 5 July 2012. E. Darch (HES), 13 July 2012. Middle Bronze Age copper alloy rapier blade, (S5). 1 medieval coin, a brooch and buckles. Medieval seal matrix and buckle frame. <S2> Newspaper Article: Eastern Daily Press. 2012. 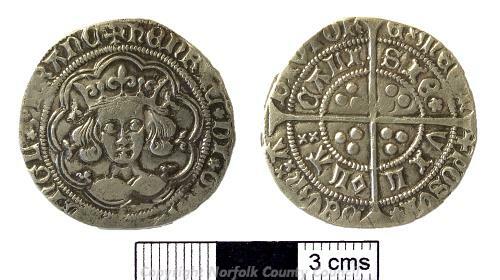 Treasure found by Norfolk detectorists. 6 July. <S3> Illustration: White, S.. 1997. Drawing of a Roman cosmetic mortar.. Film. 2:1. <S4> Illustration: Holness, A.. 1998. 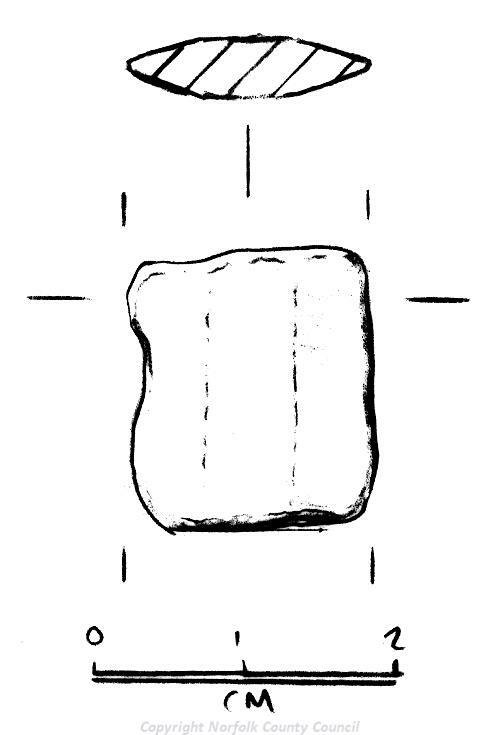 Drawing of An Early Saxon lead knob from a cruciform brooch.. Paper. 1:1. <S5> Illustration: Gibbons, J.. 2012. Drawing of a Middle Bronze Age copper alloy rapier blade.. Film. 1:1.